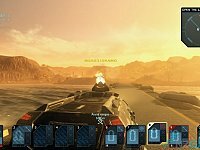 Jim Rossignol from www.rockpapershotgun.com reviewed the PC version of Carrier Command. This fragility is critical to keeping you engaged as you play. This is not RTS where you throw away units without a thought, no, every loss is a major blow. Keeping your craft alive is critical, and you’ll be sending them back to the carrier, or to rearming and refuelling stations across the island, to keep them alive. Vigilance must be constant, and it feels like an operation on a knife edge. The first thing is that this is (AI worries aside) a solid and capable experience. You soon grasp what you’re required to do, and settle into the long haul. It’s a war, and the individual battles make up the patchwork of a much wider, ongoing struggle. Nor do individual battles really stand out, which is a shame, because after a while they become somewhat rote. The minimal variety of enemies and the lack of imagination on the part of the AI means that the fights are not, after the first few hours, particularly engaging. Sure, there are new weapons to enjoy, but that’s it. Battles might still be fist-bump worthy from time-to-time, because of what they mean to your campaign, but the campaign is everything. For a certain type of gamer – a sort of armchair colonel, who likes to get stuck in, but really cares more about operational matters – this will sound a exciting klaxon. It’s a well-craft game in most regards. Secondly, the pace of the game is slow. You do not charge in to attack an island. You pick away its defences. You make refuelling and rearming runs. Once an island is taken you have to slowly trundle back to your mobile floating base. Between islands you watch the carrier slowly (although time is sped up) pilot its way to the next destination. Slow and steady. It’s not exactly a killer pace, but for a game of both action and strategy, it’s a relaxed affair. And that’s fine. 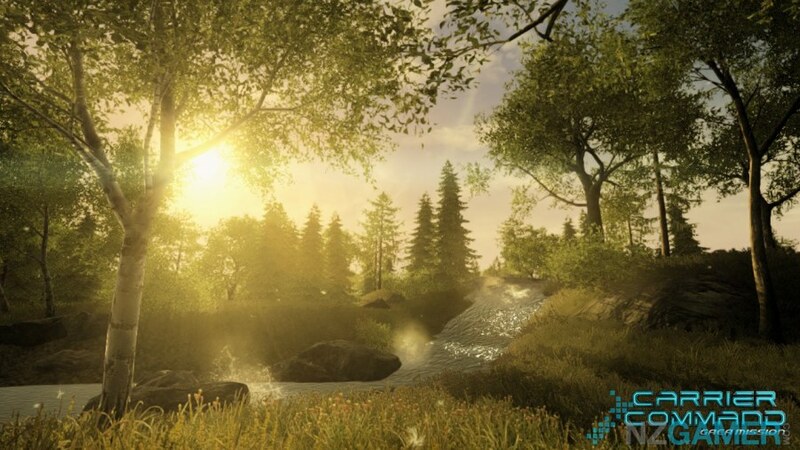 It’s just that some gamers – not that armchair colonel – will find the pace far too sedate. If this game had been multiplayer (it’s single-player only), and immediately open to modding, we might have seen a treasure chest cracked open. But it’s not, and I don’t think that will happen. 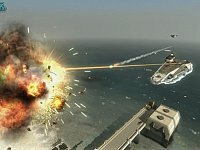 Here is a review of the Carrier Command: Gaea mission PC version by Harry Hughes from pc.mmgn.com. My anxieties were strengthened immediately upon entering the campaign, where the story kicks off with a few sequences of FPS action. After completing just a few objectives, however, the game made a sudden transition into a more strategy-based style of play. Perhaps the abruptness of this change is what forced me into a state of immense worry. From here, thankfully, everything began to shift into place nicely. The RTS elements were gradually eased into the experience and soon, an incredible action/strategy hybrid came alive! The game is both accessible and versatile: those new to the RTS genre can take control of their vehicles and learn the ropes before returning to the commander’s chair, or continue to control each individual unit. This opens up a range of different playing styles and possibilities, and might just redefine strategy gaming just as the original Carrier Command did so many years ago. Having pinpointed the accessibility of this game as a huge positive, however, I feel obligated to report that a huge level of depth can be found with just a little experimentation with each unit and their different abilities. As such, while seasoned real time strategists may initially be disappointed with what Gaea Mission has to offer, playing through the campaign in its entirety will allow players to uncover a tactical game capable of competing with just about anything on the market. 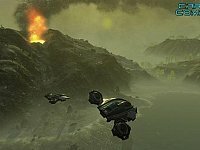 For all the things this game does well, however, there is one big gaping hole in the experience which will frustrate players and leave a sour taste in their mouths: the path-finding of ground-based vehicles. 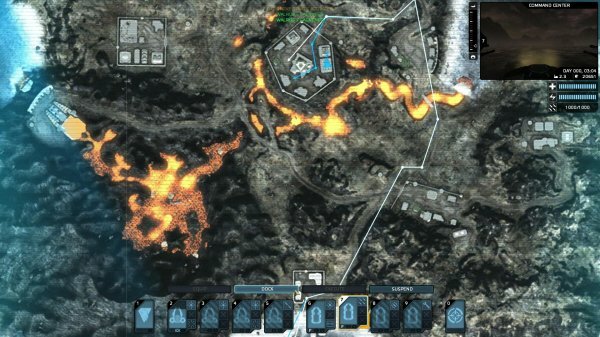 While the complexities of pathfinding on three-dimensional terrain probably can’t be overstated, there’s no real excuse for AI-controlled units to be circling around as they struggle to comprehend their surroundings, let alone get from point A to point B.
Luke Percy from nzgamer.com reviewed the PC version of Carrier Command. 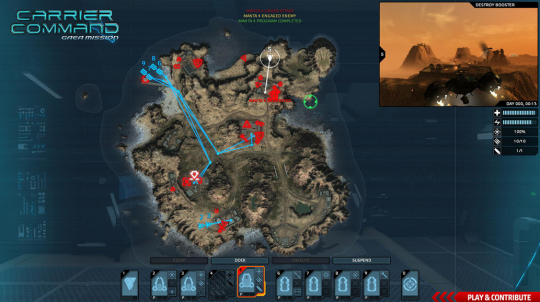 The main control of the game is through a top down radar map, where all the gameplay action is displayed in a small window in the top right corner of the screen. All your orders are performed by setting waypoints with contextual motivations of the units via a radial menu: these include commands such as "defensive", "offensive", and "protect" - etc. By sending units to various buildings on the map, you can take control and use them to build more units or gather further resources. 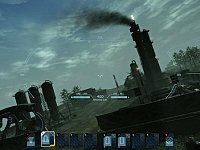 Because you have to gradually collect various resource and production buildings, it can take quite some time to get into the main part of the gameplay. Be prepared to sit down for at least one to two hours just to get two or three Walrus on the field, and almost twice the time again to start producing air units. But, once the core elements are in place, the game can get quite addictive. 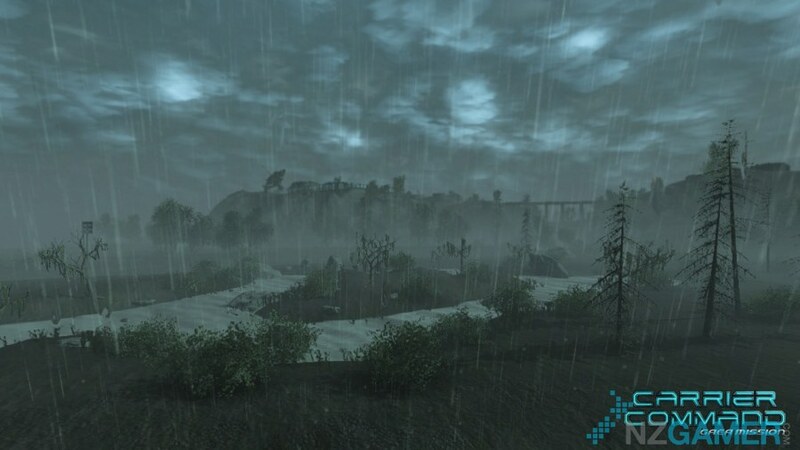 Each mission features dynamic weather which affects the terrain, varying from tropical sun to snow blizzards and rain, so when your Walrus is treading mud in a rainstorm, it's time to upgrade to the Manta and attack from the air - but watch out for lightning! All of which adds a dynamic element to the strategy of any given situation. There's no multiplayer... none. This game could be really awesome to play against friends, but unfortunately it was not on the cards for Bohemia. I’m crossing my fingers for a Multiplayer DLC in the future, as I think Carrier Command: Gaea mission would get some serious online time if it was available. Carrier Command: Gaea Mission shows that Bohemia are real fans of the original game, and they have managed to reboot an 80’s classic in a way that I believe no one else could pull off as successfully or with so much care. Bohemia Interactive announced Carrier Command: Gaea Mission is now available in stores worldwide for both the PC and the Xbox360! 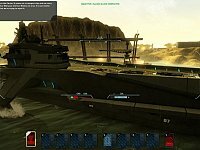 To celebrate the long-anticipated release of Carrier Command: Gaea Mission, Bohemia Interactive has just shipped the game’s launch trailer. 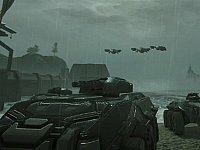 As of today, Carrier Command: Gaea Mission is available in stores worldwide for both Windows PC and the Xbox 360® video game and entertainment system from Microsoft. Based on the groundbreaking classic from 1988, Carrier Command: Gaea Mission offers a blend of first- and third-person vehicular combat with tactical and strategic elements. 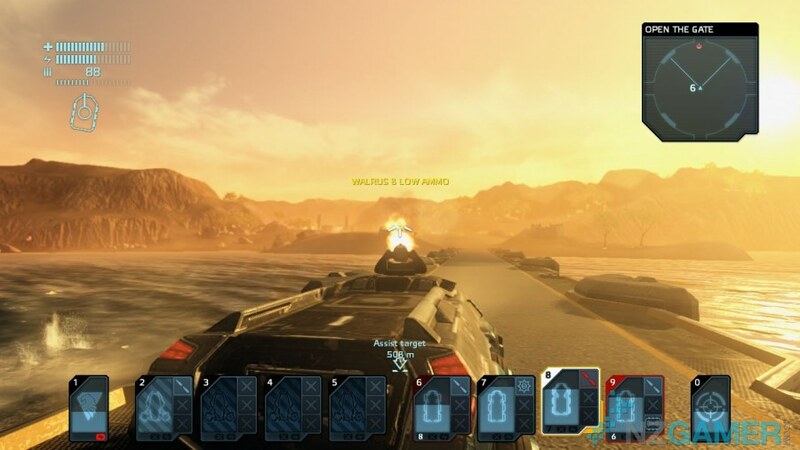 In a massive sandbox, consisting of 33 unique islands hosting 6 distinct climatic zones, players are put in command of a futuristic military carrier holding multiple remotely controllable and customizable units. By traversing the seas and establishing a strategic network of island bases for mining, production and defense, players will set sail for a titanic game of conquest. Unlike the original, Carrier Command: Gaea Mission also features a story-based campaign. Here, players take up the role of Lt Myrik, a battle-hardened soldier of the United Earth Coalition who has been sent to Taurus to repel occupying forces of the Asian Pacific Alliance. Alternatively, people can go head on with a mode similar to the original Carrier Command, named Strategy Game. 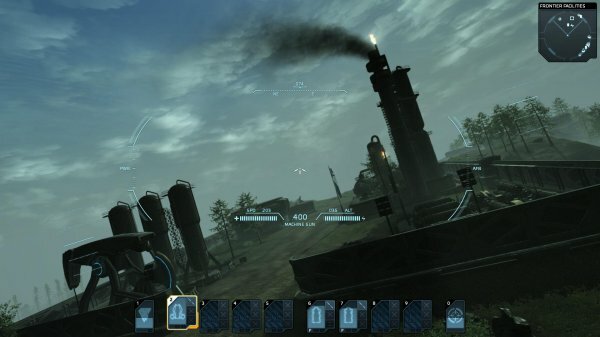 In this mode, players can set starting parameters such as enemy strength and available resources, which determine the difficulty and length of a game. Carrier Command: Gaea Mission is now available for £29.99 / €39,99 on Windows PC and £34.99 / €49,99 on Xbox 360. 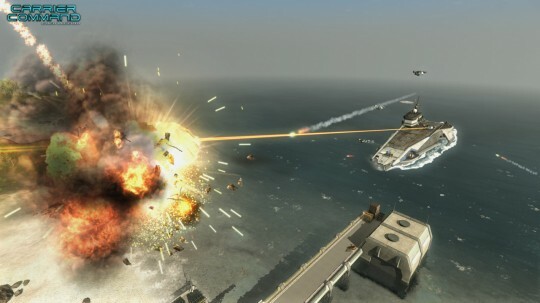 For more information about where to order the game, go to http://www.carriercommand.com/buy. 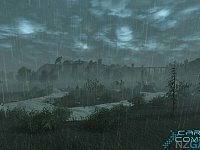 Jonathan Lester from dealspwn.com wrote a detailed and informative review of the PC version of Carrier Command: Gaea mission. 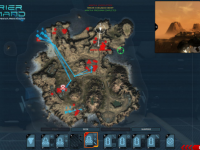 In this review he digs deeper inside the skirmish mode of Carrier Command but also shares with us what he thinks of the campaign. Gaea Mission had a lot on its plate, and I'm delighted to report that its randomised Strategy (skirmish) mode delivers the goods. I wish that I could say the same about the singleplayer campaign. The Strategy mode is a pitch-perfect recreation of the original Carrier Command. It's your carrier versus the enemy in a battle to take over a massive sprawling archipelago of islands, which bristle with AI defenders, turrets and fortifications. Your mobile HQ can be ordered about from an intuitive map screen or steered directly in third-person view, enabling you to bombard the islands' inhabitants with withering firepower, granting you a satisfying feeling of absolute naval supremacy. Should you encounter the opposing carrier, a tense and exhilarating showdown ensues, rewarding you with the win depending on your custom victory conditions. What should have been a tutorial followed by some exciting missions turns into a protracted and infinitely more annoying version of the Strategy mode: the same basic setup, but limited by linear progression and accompanied by some of the worst voice acting and least relateable characters on the market. The throwaway storyline involving a barely-explained conflict over a colony world, hackneyed scripting and pedestrian character designs are unbelievably generic to the point of laziness. A good singleplayer campaign should act as a showcase or highlight reel, but here, it's just a rehash of the skirmish mode sullied by noxiously awful drivel being pumped into your ears on a regular basis. 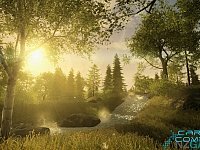 Executive Producer Jan Kunt from Bohemia Interactive have released a beta version of the Carrier Command: Gaea Mission SDK on the BI forums. Finally, after taking much longer than I originally expected, here is the first version of CCGM SDK. This version is distributed as a Beta Patch, which also installs SDK. This installer works for regular non steam version. Steam users may get SDK by selecting "SDK" in the beta tab in Preferences of Carrier Command in their Steam Library. Information about how to use it may be found on the bistudio wiki. Special SDK section have been also created in the Feedback tracker for reporting bugs. Special note - carrier.exe parameter "-mod" will only work on version 1.03.0019 and above (version included in this patch). If there are no major issues with the SDK we will shortly release patch 1.04 to introduce this modding compatibility to all customers. Korneel van 't Land informed us Bohemia Interactive have released the official version 1.04 patch for Carrier Command: Gaea mission. If you want to download the Patch 1.04 combined with the SDK for modders make sure to select the "Carrier Command: Gaea Mission Patch 1.04 SDK" download! Also the patch removes DRM so no more activations upon reinstall of the game and/or Operating System. A new update for Carrier Command has sailed in - shipment includes a number of game and campaign fixes, plus improved mod support for creative commandeering. Save Games created in versions 1.1.0026 and older are not compatible. The game will notify you if the Save file was created in an incompatible version. Korneel van 't Land informed us Bohemia Interactive have released the official version 1.03 patch for Carrier Command: Gaea mission. In response to player feedback, Bohemia Interactive has released a new update for Carrier Command: Gaea Mission. Patch 1.03 aims to address a number of issues, including those related to the pathfinding of ground units. 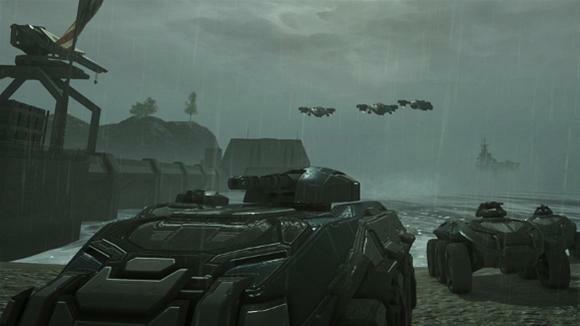 Although the recently released Carrier Command: Gaea mission was received with open arms, many people found themselves struggling with ordering their Walrus ground units across the map. Thus, aside a variety of other game- and campaign-related fixes, this update delivers a welcome improvement to the Walrus AI and island navigation data. The complete overview of changes can be found in the changelog provided in the update’s Readme file. Based on the classic from 1988, Carrier Command: Gaea Mission offers a refreshing blend of vehicular combat with tactical and strategic elements. 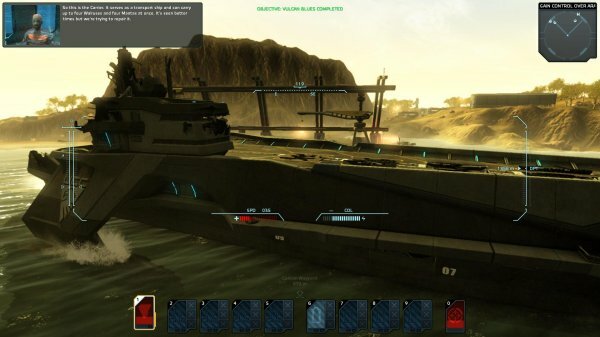 In a massive open world - consisting of 33 unique islands hosting 6 distinct climatic zones - players are put in command of a futuristic military carrier holding multiple customizable units. 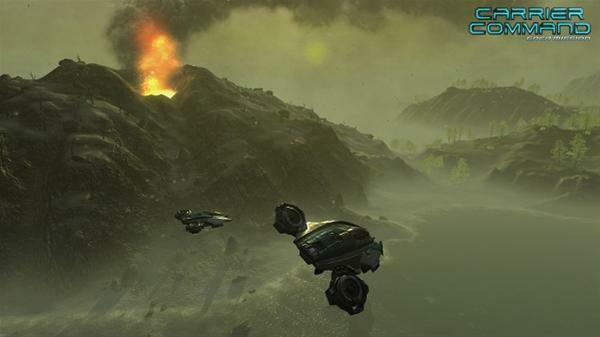 By traversing the seas and establishing a strategic network of island bases for mining, production and defense, players set out to conquer the archipelago on planetoid Taurus. Please note save games created in versions 1.1.0026 and older are not compatible with this update! The game will notify you if the save file was created in an incompatible version. This patch is not for the Steam version, Steam versions will auto-update. 17 items in this section.